The MNPV6-250 DISCO's red handled is LOCKABLE IN THE OFF POSITION! 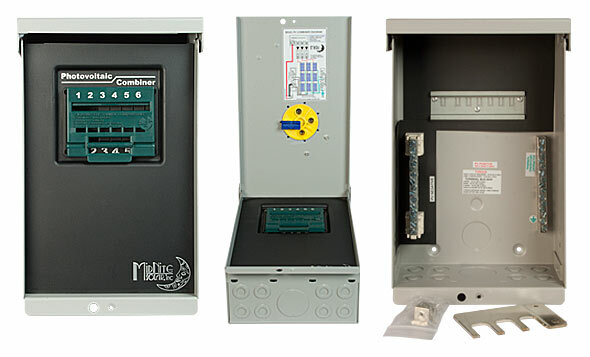 Off-grid PV combiner for use with up to 3 300VDC breakers with the included buss-bar. Also included is the deadfront (MNPV6DF) and the MNPV6-DISCO-SLIDER. Load break rated. Enclosure only with the busbar shown. Description: Enclosure only - NOT COMPATIBLE WITH THE BIRDHOUSE. Replacement Slider for the MNPV6 Disco.